Pub in Colindale, previously called the New Chandos photo. 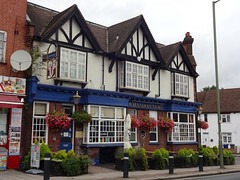 As of May 2012, Pubs Galore reported that the New Chandos was closed and boarded up. It reopened as the Chandos Arms in March 2013, after a substantial refurbishment, and now has real ale. We haven't visited the new version yet, but the information below is retained for people who want to know what it used to be like as the New Chandos. Pub in Colindale, just down the road from Colindale Station. Inside, it has one large main bar room and a smaller room ("Joe's Spurs Lounge", over-18s only) which features pool tables and a big Tottenham Hotspurs flag hung on the wall. The main bar is carpeted and has banquette seating plus freestanding tables and chairs and a fair bit of standing space, as well as a dartboard on its own little raised dais. There's also a covered drinking patio out the back, accessed via the main bar. Kake visited on a Tuesday afternoon in October 2009. Although there are two handpumps on the bar, they were both bare of pump clip. I had Strongbow (£1.50/half) instead. When I arrived around 5pm, there were about a dozen people in, including a couple of children, and the level of custom stayed about the same during the hour I was there. Music was playing on the radio, and the flatscreens above the bar were showing daytime TV with the sound off. They do food photo of menu board in October 2009 but it's not clear what times. A board seen outside in October 2009 advertised jam nights on Mondays (9pm-11:30pm), poker nights on Thursdays (7pm-11:30pm), and live bands/karaoke on Saturdays. Accessibility: A couple of steps up at the "side" entrances on Annesley Avenue (which actually lead into the main bar), but there's level access from Colindale Avenue, via the pool room. Once you're in, there's level access to the bar, seating area, and accessible toilet. Last visited by Kake, 6 October 2009. Last edited 2017-09-06 08:14:04 (version 7; diff). List all versions. Page last edited 2017-09-06 08:14:04 (version 7).